In an always-connected world where brand success is driven by user experience, the opportunities for improvement in digital banking—particularly the corporate market— are enormous. Corporate banking functionality with a best-in-class user experience like Netflix, Apple, or Amazon could be a game changer. 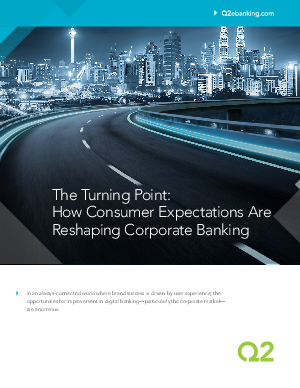 To learn more, download Q2’s latest white paper, The Turning Point: How Consumer Expectations Are Reshaping Corporate Banking.